My mother, Susan Bulmer, has a bat named after her. Bulmer’s Fruit Bat, Aproteles bulmerae. It’s a giant fruit bat from the remote highlands of New Guinea. And it used to be extinct, but probably isn’t. 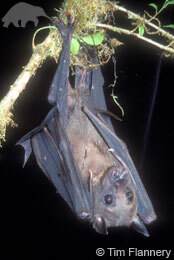 Bulmer’s Fruit Bat, Aproteles bulmerae. Photo by Tim Flannery and used with his kind permission. As a young woman, before she was tied down with children, Sue was an intrepid archaeologist, the first to carry out excavations in the New Guinea highlands. In 1959, in Auckland, Sue married my father, the anthropologist and ethnobiologist Ralph Bulmer. A few weeks later they were in New Guinea. Sue told me more than once that she only agreed to marry Ralph in order to get to New Guinea. In the 1950s it would have been very difficult, if not impossible, for a young, unmarried woman to do research in New Guinea. Ralph had already been on more than one research trip to New Guinea (which had cost him his first marriage). For the first few weeks the newly-weds were based at Baiyer River in the Western Highlands, where they laid the foundations for a couple of landmark papers, which they wrote together, on the prehistory of the New Guinea highlands. After this short “honeymoon”, Ralph went off to do his own research in another remote part of the highlands, the Kaironk Valley. 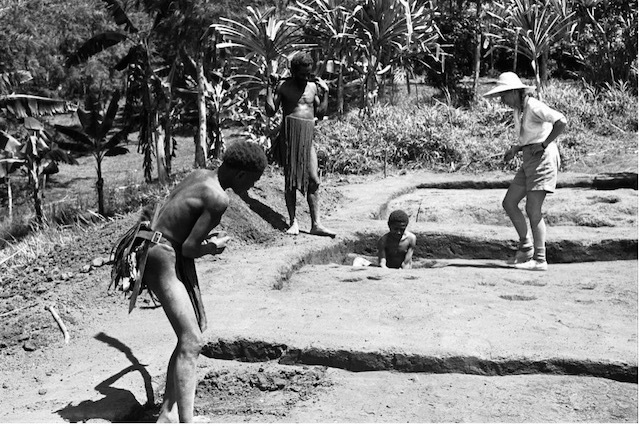 Sue Bulmer excavating in the New Guinea highlands in 1959, with young highlanders as field assistants. Photograph taken by my father, Ralph Bulmer. Sue proceeded to carry out field surveys and excavations on her own, with her typical energy and passion. She ran the digs with young New Guinea men, who didn’t speak English, as field assistants. These young men, who had not yet undergone initiation into adulthood, were the only people willing to work with her, she told me. 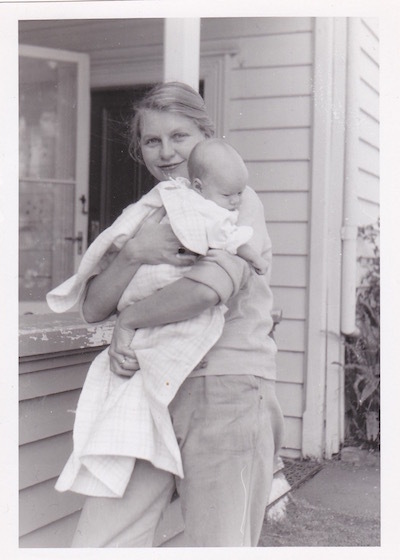 Sue returned to New Zealand in May 1960, and very soon she was pregnant with me. Two brothers arrived in quick succession after that. Having three young children slowed Sue down for a few years, especially since there were no childcare centres in the 1960s. However, she was always active as an archaeologist. Sue with me in 1961. Less than twelve months earlier she had been digging in New Guinea. The materials Sue excavated at a rock shelter at Kiowa in Chimbu Province in 1959 included quantities of animal and bird bones. In due course Sue sent these to her colleague, the zoologist James Menzies. He identified the bat bones as being from a previously unknown species, and named it Aproteles bulmerae, in Sue’s honour. The Aproteles bit refers to the characteristically gappy teeth in the bat’s jaw. I think my father might have been a bit miffed about this. For a 20th century scientist, having something bearing your name was a priceless piece of cultural glory. Ralph did have Litoria bulmeri, Bulmer’s Tree Frog, named after him, but a small tree frog doesn’t have quite the same impact as a mega bat. Scientists can be competitive, even when it’s their spouse. James Menzies concluded that Aproteles bulmerae was an extinct species, because the site where it was found was dated at 10,000 BC. He believed the bats had died out at the end of the last Ice Age. But New Guinea is full of surprises. In 1975 a large colony of Bulmer’s Fruit Bats was discovered in a remote cave called Luplupwintem in the remote Western Highlands. However, soon after their rediscovery the bats fell prey to hunters with guns, and within a few years the cave was empty. It seemed that the Bulmer’s Fruit Bat was now truly extinct. But in 1992 the eminent Australian naturalist Tim Flannery and his New Guinea colleague Lester Seri from the Papua New Guinea Department of Environment and Conservation found a small population of Bulmer’s Fruit Bats living in the cave. Aproteles Bulmerae, rediscovered by Lester Seri and Tim Flannery. Photo used with kind permission of Tim Flannery. The whole saga has been well described by Tim Flannery, in his 1994 article “The Fall and Rise of Bulmer’s Fruit Bat”. You can read the full article here. It’s a fascinating story that highlights the fact that there’s a lot happening in the New Guinea highlands that scientists don’t know about. Some years ago my brother David wrote a song celebrating our family bat, “The Ballad of Bulmer’s Fruit Bat”. It has become a regular feature of Christmas and other family gatherings. On January 1st this year we finally made a demo recording of the bat song. Here’s a link to the recording. Sue kept her boxes of Papua New Guinea research materials in her laboratory, which she had built in her back garden. She was actively researching all her life, until dementia stopped her in her tracks. Some of her later publications were about other animals important to New Guinea people: pigs, and the New Guinea Singing Dog. Here is a link to a film about Tim Flannery and Lester Seri visiting the bat cave at Luplupwintem. 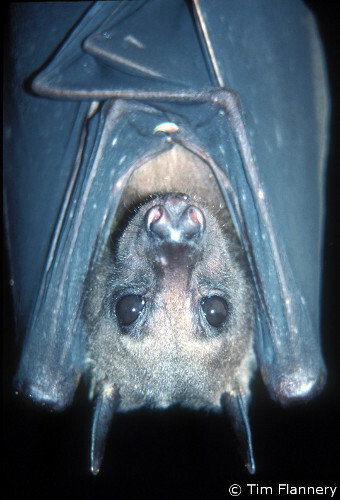 “The Fall and Rise of Bulmer’s Fruit Bat” is featured in a chapter of Tim Flannery’s book An Explorer’s Notebook: Essays on life, history and climate (Text Publishing, Melbourne 2007).